wan life to live: happy easter from the easter bean! hope you find lots and lots of eggs today! Well this flies in the face of Thatboy's comment that the Easter Bunny is racist since he's always a white bunny. =) Happy Easter to the Wan clan! 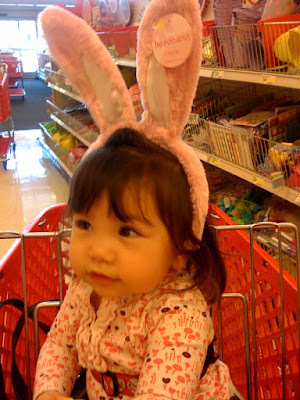 She looks cute as a bunny! I want to eat up her puffy little cheeks!